Margarita Island (Isla Margarita), Venezuela. 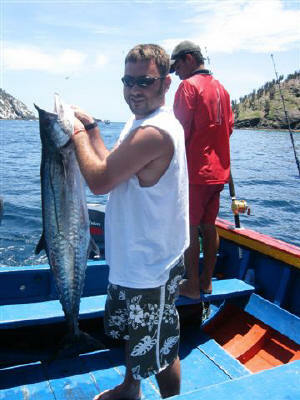 We will give you an experience that many of the local Margarita fishermen go through every day. While they use nets for their fishing we will use trolling tackle and will go over the same areas that they frequent. This is an experience of a lifetime which includes the chance to see dolphins or whales and thousands of sea birds that frequent the Islands of Los Frailes. 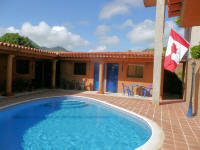 Departures from "El Tirano" to Los Frailes around 9:15 - 9:30 AM with an English speaking guide. The pick-up time will depend on where you are located on the Island. The tour begins with a trolling trip around the beautiful Islands of Los Frailes where you'll see dolphins and maybe whales and a lot of sea birds. After this beautiful trip we'll go to a typical fisherman's ranch where we'll enjoy a lunch, alcoholic and non-alcoholic beverages. After lunch we will continue the fishing at a different location around the Islands. This tour includes all transportation, equipment (rods, hand reels, baits and lures). There will also be a short time to snorkel if you want. The return to "El Tirano" is around 3.30 - 4 PM. You will be returned to your hotel at the end of the day at around 4.30 PM. Tuna, Wahoo, Jacks, Bonito, King Mackerel, Barracuda, etc. 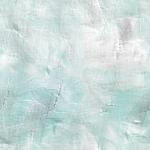 The species available on any given day depend on the climatic conditions and currents in the area. The cost is US$ per person. the minimum charge would be US$. This would cover up to 4 persons. The maximum for the boat is 6 persons (US$). If you are a single or couple we can help you group with others so that you can enjoy a day of fishing. Due to the distance of the harbour from the fishing area we can't accept cruise ship reservations unless you arrive no later than 8 AM and leave no later than 6 PM. From US$30 - See www.casatrudel.com for info! a special day of snorkeling at Los Frailes at areas suited especailly for snorkeling.